Discover the natural wonders and rich cultural history of Belize. This laidback paradise is packed full of lush jungle, spectacular ruins, long sandy beaches and first-class underwater attractions – and on this trip you’ll sample them all. From the buzz of Belize City, through the magic of the jungle-clad Tikal ruins and to the beachside island paradise of Caye Caulker, discover the best of Belize and Tikal on this epic adventure to some of Central America’s little-known gems. The itinerary was well thought out. Our trip leader Carlos was very helpful and friendly. We had an amazing group and Carlos was incredible, kind and well organized. Primarily because Carlos was fantastic!Otherwise the trip was well planned and executed. Intrepid made traveling alone a very pleasant experience, and I got a chance to meet new people along the way. Mostly down to our fantastic guide Carlos. He was absolutely awesome, and made everything so easy for us all whilst at the same time being great fun to hang out with! The tour was the perfect combination between culture and fun. Hello! Welcome to Belize. Located where the Belize River meets the Caribbean Sea, this bustling former capital is full of history and culture. Your adventure begins with a welcome meeting at 6pm where you'll meet your tour leader and travel group. Belize City isn't the nicest place we visit in Central America but it is the best option available for the starting point of this tour. Like any big city in this region, Belize City has some issues with street crime and we advise visitors to take every precaution when you're outside the hotel. Don't take any valuables when you go out and keep your camera safe. At night, always try to go out in a group and stay on the main streets. The area around our hotel is the safest in the city and is often called the tourist village. You can walk to the nearby lighthouse and enjoy the beautiful sea views. If you have some extra time and want to explore the city further we recommend you take a taxi, even when travelling relatively short distances. You can organise for a taxi to pick you up at the hotel and wait for you at each stop. This might be a little more expensive but it's safer and you can make the most of your time in the city. There are some interesting places to visit. Belize City is divided by the world's only remaining manual swing bridge. On the north side is the coastal and maritime museum, housed in the beautiful restored former fire station. Also in the north is the Image Factory, displaying contemporary Belizean artists, and the National Handicraft Centre. The oldest Anglican church in Central America, St John Cathedral, was built in 1812 with bricks brought as ballast in European sailing ships. Opposite is Government House, a preserved colonial mansion. Belize is the only English speaking country in Central America, which will make chatting with locals much easier. The Belizeans are known for their relaxed and easy going way of live. You will be amazed how many different cultures coexist harmoniously here. Leave the hotel around 8 am to catch the 9 am local bus to San Ignacio (about 3 hours), a lush tropical region brimming with waterfalls, warm swimming holes and the intricate cave systems of the Mountain Pine Ridge Forest Reserve. Upon arrival around 2:30 pm, take a trip to the impressive ruins of Cahal Pech, the oldest known Maya site in Belize. These ruins, which were once a major ceremonial centre, stand tall on a hill overlooking San Ignacio. Spend appoximately two hours here exploring at your own pace. You have a free day to take on any of the many optional activities available. Perhaps take a day trip to Xunantunich, an impressive Maya ceremonial centre located with panoramic views over the countryside. The east side of one of the temples has a unique stucco frieze and the central plaza has three carved stelae. Getting to the site is half the fun as you'll need to take a hand-cranked ferry to cross the river.The cave of Actun Tunichil Muknal is a living museum of Mayan relics. Wade through water until you reach the Mayan ceremonial site. Here you will find ceramic pots and crystallised skeletons, preserved by the natural processes of the cave for over 1400 years. Other options to fill in your time in San Ignacio include a day trip to the Mountain Pine Ridge area to visit waterfalls and warm swimming holes, as well as a huge cave system, the butterfly garden, canoeing or river tubing. Depart the hotel at 8:30 am, taking the 30-minute taxi ride to the border. After crossing from Belize into Guatemala, travel by private vehicle, stopping for lunch on the way, and arriving to Tikal around 1 pm. Tonight we camp on the grounds of a hotel which is located close by to this majestic Mayan site. Regroup at 2 pm to explore the National Park until sunset (approximately 3 hours). Towering above the jungle, the five granite temples of Tikal are an awesome sight and one of the most magnificent Maya ruins. Hidden in the jungle growth is a maze of smaller structures just waiting to be explored. The energetic can climb to the top of the ruins for spectacular views over the canopy. You may even spot toucans, macaws and other colourful birds. If you haven't had enough of Tikal you have the option to visit the site again at sunrise this morning (entrance fee not included). Otherwise it's a long travel day, (approx. 6-7 hours depending on border crossing conditions) so you'll leave the campsite by private vehicle at 7 am. Once over the border in Belize, travel by local bus to Belize City where we board a water taxi (1 hour) to Caye Caulker. 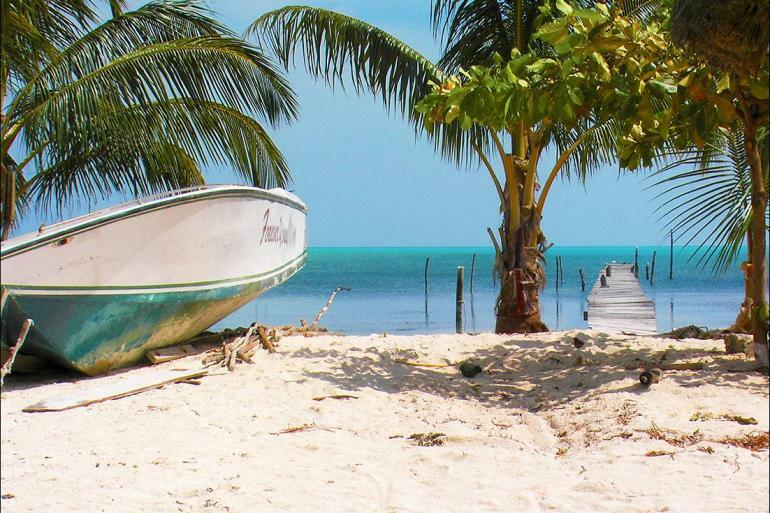 The Belize Cayes are a group of islands a short boat ride away from the coast. There are a number of these islands to choose from, but we base ourselves on Caye Caulker as this is one of the more popular islands with travellers. From here it is possible to arrange day trips to other cayes, to the best reefs for snorkelling, or simply to take a local boat out to the reef of Caulker itself. Each island has its own particular character, but all of them have the unmistakeable Caribbean pace and charm. Relax on the beach or head out to Hol Chan Marine Reserve, home to the magnificent Blue Hole and the world's second longest barrier reef. Snorkel among the colorful corals and see tropical fish, sharks and manta rays. Today is another free day for optional activities. If you're interested in sampling local cuisine, Caye Caulker is famous for its lobster. Not the cheapest meal you'll ever buy, but so good. Always make sure that you respect the season: the lobsters can only be caught between June 15th and February 15th. Some of the best meals on the island are cooked on the road side. How about some grilled shrimp and a lovely rum and coke made with the local fire water? On the last day we usually take the 9 am water taxi back to Belize City (1 hour). With no other planned activities for the day, the trip ends at the port in Belize City, and you can safely continue your onward journey from 12 pm (midday). Please ask your tour leader If you need any assistance arranging transport to the Airport.